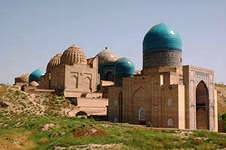 One of the world-famous ancient burial places of Central Asia Shahi Zinda is located in the north-east of Samarkand. Ensemble includes mausoleums and other religious buildings 11-14, and 19th centuries. Shahi Zinda in Arabic means "The Living King". According to legend, the Prophet Mohammed a cousin Kusam ibn Abbas, who was sent to earth to preach religion Islam. During the prayer he was killed and beheaded. As he was saint, he didn’t die, but he took his head and went down to the cave where he drank living water, getting immortality. It is said that to this day he lives there. There is also a holly tree at the end of the corridor on the east side of the cemetery Shah-i-Zinda. According to legend, it is able to fulfill wishes. Legend says he who twice visits the complex Shahi-Zinda, will make satisfaction for sins and be forgiven from on high.